Archive of Planning Commission meetings 2015-2018. If you wish to review Planning Commission Meeting packets prior to 2015 please email pv.planning@gmail.com or visit our office on the 2nd floor of City Hall. The meeting video archives can be found by clicking here . 3.1 Written Communication: Planning Commissioner Michael Saragosa's resignation letter. 4.2 Project: Variance (VAR) 18-02 - 863 Conrad Court. 5.1 Discussion of Amendment to Article 7(d) of the Planning Commission Bylaws . Variance 15-02 - Fornii Road Hotel : Application 12 month extension . exterior elevation modifications of an existing commercial building (Raley’s). Property is located at 166 Placerville Drive. the Samuel L. Turner House, a City historic resource. (This matter was conitinued from the August 15, 2017 Regular Meeting. 5.1 425 Main Street - Site Plan Review 16-06 - Pedestrian footbridge. Zone Change (ZC) 10-02) (continued from June 6, 2017 Planning Commission Meeting) . 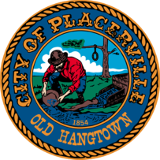 5.1 Amendments to the City of Placerville Development Guide - Chapter XIII. Signage.